Expedition Northern Norway! Welcome to Lofoten in the land of the Midnight Sun, just one of stops along the way of my journey to the Arctic. Photo © Jørn Allan Pedersen and VisitNorway.com. Unauthorized use is prohibited. Culture, history and nature take center stage on this Arctic expedition to Northern Norway. Beneath the midnight sun, we'll embark on exciting adventures and journeys of discovery in this Arctic realm of the north. 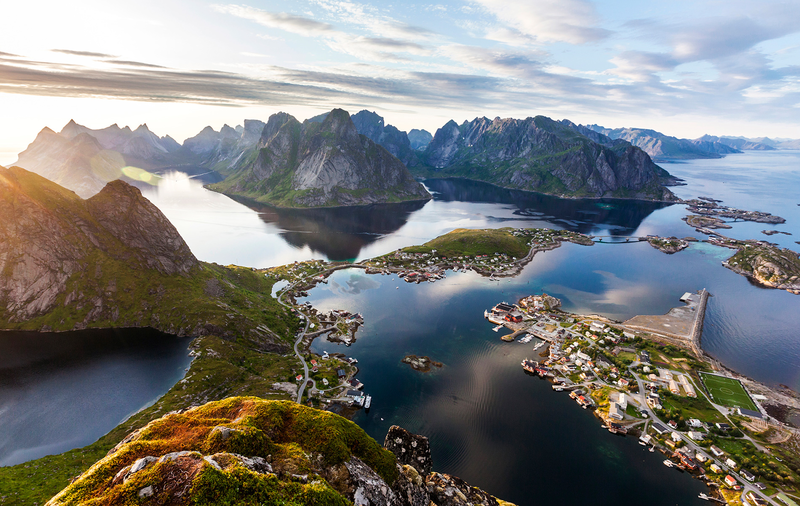 From whale safaris and kayaking to history and culture, and even kissing wolves, this action-packed visit to the northwest coast of Norway will undoubtedly yield unforgettable memories and forever, change this explorer's view of the world! Join me on this exciting expedition to northern Norway! 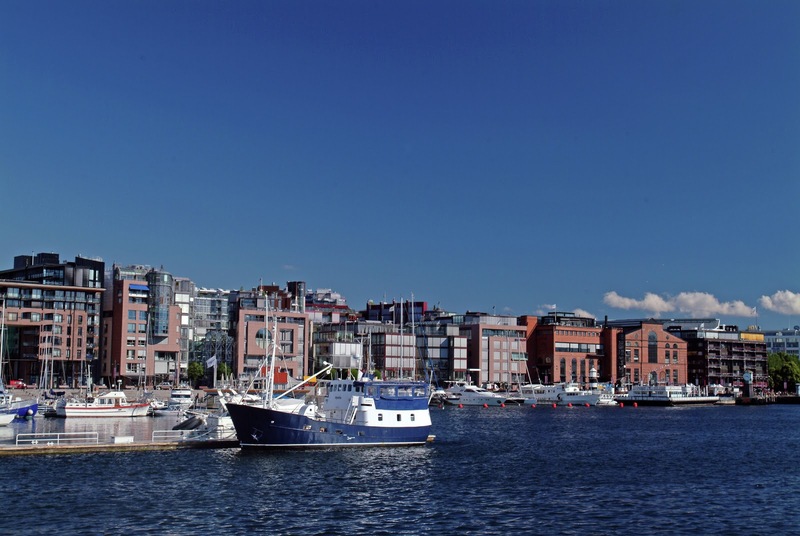 The vibrant shopping district of Aker Brygge as seen from Oslofjord. Photo © Nancy Bundt and VisitNorway.com. Unauthorized use is prohibited. It all begins in Oslo and with so many places to see in Norway's capital city in one day, I carefully mapped out my itinerary for an exciting day full of discovery. From The Thief, my temporary and quite luxurious home for my short stay, I'll follow the shores of the Oslofjord with stops along the way. 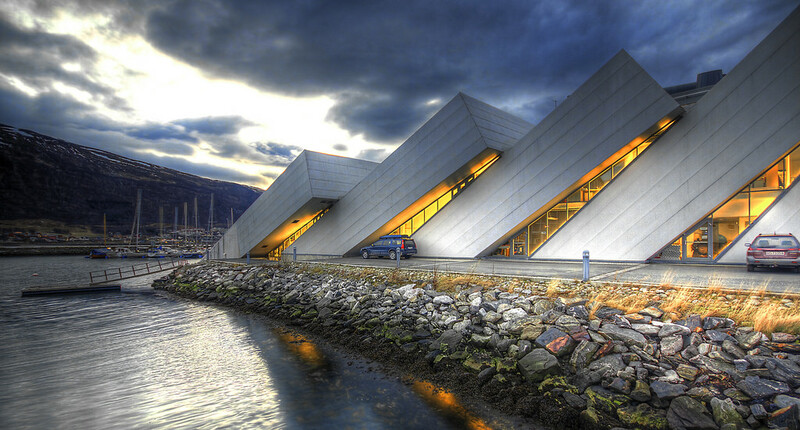 First up, the Astrup Fearnly, a stunning a contemporary and modern art museum whose exterior pays homage to the city's maritime heritage. Designed by Renzo Piano, the complex is comprised of three pavilions under a shared glass roof and when seen from above, resembles a giant sail. I wonder what fascinating discoveries await inside. Beyond the vibrant shopping district of Aker Brygge, the Nobel Peace Center promises a profound look at the laureates of the world through a series of interactive exhibits showcasing their achievements! 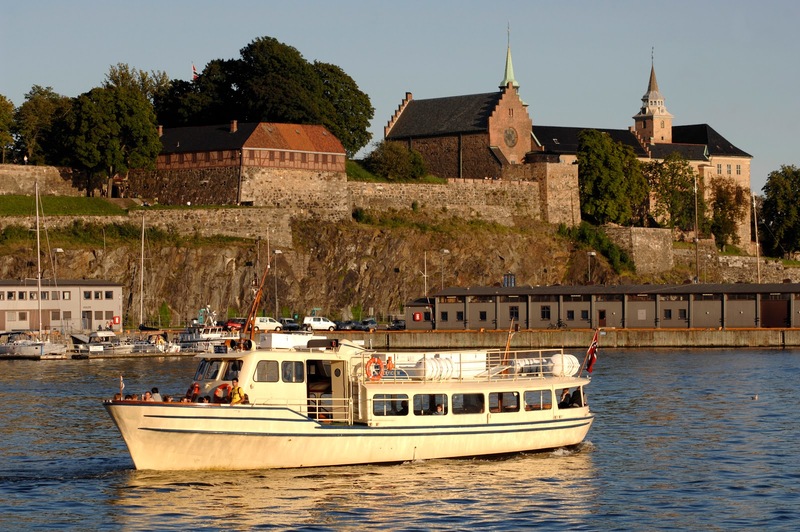 The 13th-century Akershus in Oslo. Photo: Nancy Bundt - Visitnorway.com. Unauthorized use is prohibited. Continuing my circuitous route around Oslofjord, the Akershus castle, fortress and former prison, is a look back through 700 years of mystery and intrigue. 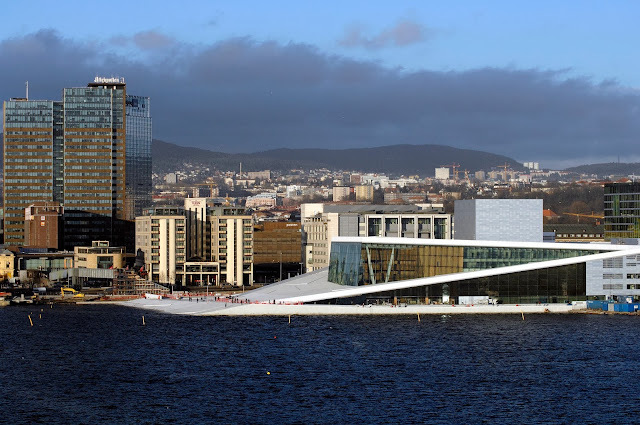 Nearby and looming on the shore is the iconic Oslo Opera House where I am hoping to capture some spectacular sights of the city from a stroll upon its rooftop. Heading in the opposite direction around the shores of the Oslofjord is the Viking Ship Museum accessible by ferry from the city center and thankfully, just a few blocks from my hotel. Inside, three 1,000-year-old Viking ships excavated from their royal burial mounds along the Oslofjord are on display with other artifacts uncovered from nearby sites. My last stop will be one of Europe's largest open-air museums, the Norwegian Folk Museum with more than 150 houses from around this Scandinavian country and a Stave church that dates back to 1200. City of Tromsø, Norway. Photo is property of VisitNorway.com. Unauthorized use is prohibited. After a discovery-filled day in Oslo, we board the plane to Tromsø in northern Norway. Located 217 miles above the Arctic Circle, Tromsø is the "Gateway to the Arctic" and the place where our Arctic adventure begins! The incredible architecture of Polaria resembles gigantic ice floes falling down like dominoes. Photo: Property of Øyvind Andreassen. Unauthorized use is prohibited. Housed in a unique structure that resembles gigantic ices floes falling down like dominoes, Polaria is an immersion into the nature and culture of life in the Arctic with panoramic films, natural exhibits, an aquarium and the "Arctic Walkway," an interactive and educational exhibit that brings to light and life the perils that face the sea ice and mountain glaciers. Fascinating insight into the pioneering way of life in the early 1800s will be had at the Polar Musuem that showcases how courageous trappers, women as well as men, survived the unforgiving Arctic landscape with little supplies and contact with the outside world. What is sure to be a real introduction to the Norwegian culture of today is our visit to Tromsø's oldest "watering hole," Ølhallen, the place to go and drink beer. When I thought about the fact that I don't like beer really, I figured I could imbibe the culture with a nice glass of wine, but had second thoughts about that after I read their website's warning, "and for heaven's sake, don't order chablis!" As if! Soaring above Tromsø, Norway. 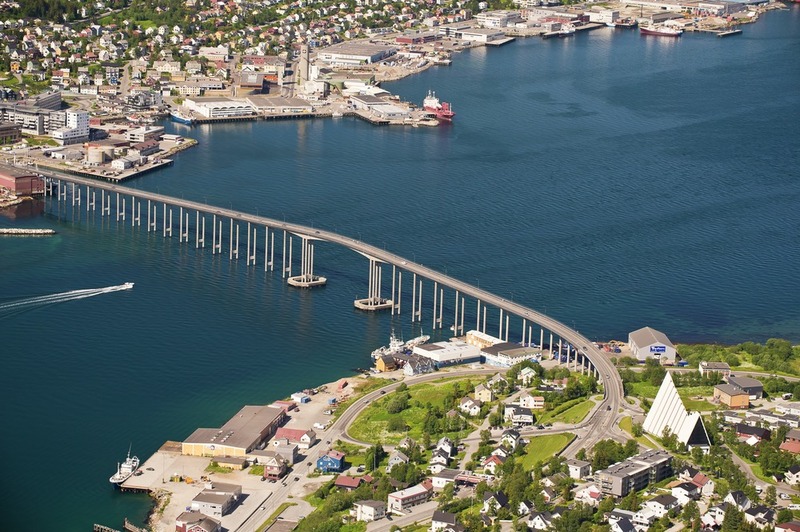 Photo: Frithjof Fure and VisitNorway.com. Unauthorized use is prohibited. 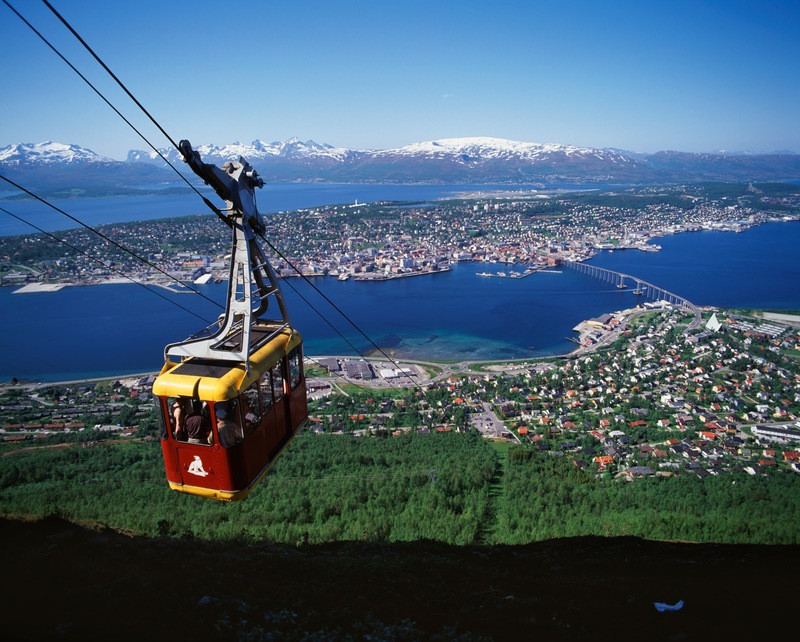 When eventide approaches, we'll soar into the midnight sun aboard the Fjellheisen cable car for inspiring views of Tromsø and the Arctic landscape. Welcome to Senja Island, Norway. 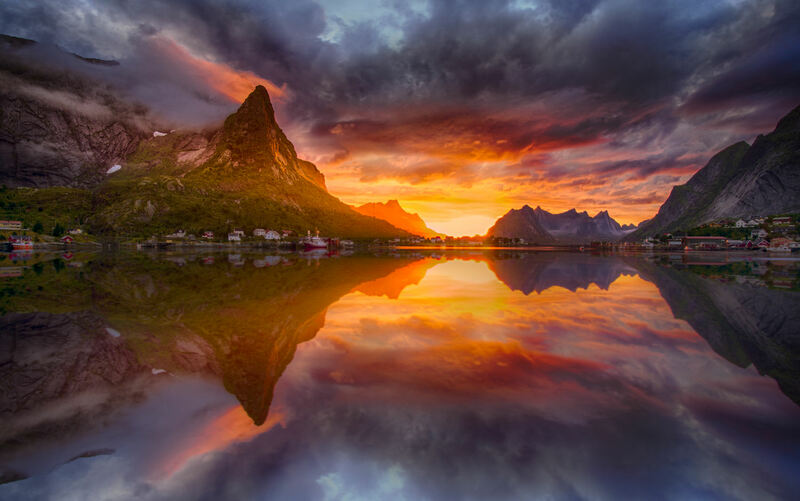 Photo: © NorthernNorway.com. Unauthorized use is prohibited. We're heading to Sommarøy for a kayaking adventure on the Norwegian fjords! 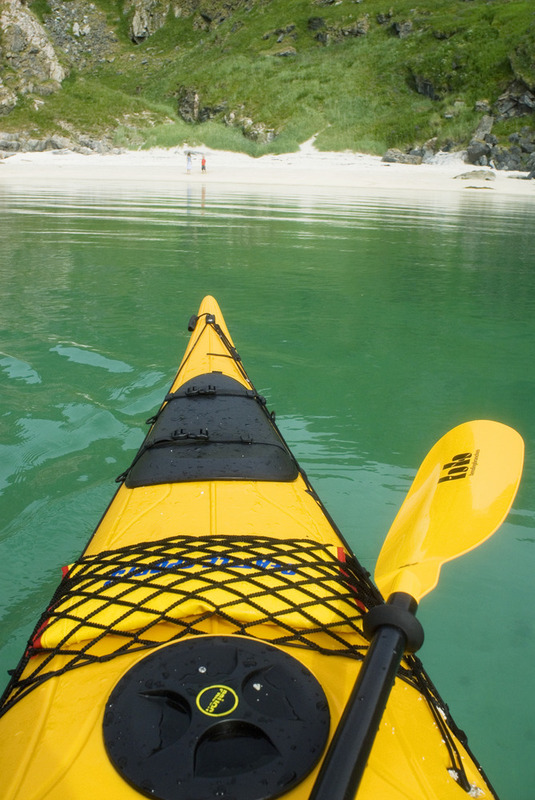 Having never sat or rowed in a kayak, I am not sure what to expect besides a total immersion into the splendorous nature of these idyllic islands of the north; getting down with nature at its best! Kayaking in Sommarøy. Photo: © C.H. and VisitNorway.com. Unauthorized use is prohibited. After lunch and a scenic crossing of the seas, we'll arrive on the island of Senja, Norway's second largest island. 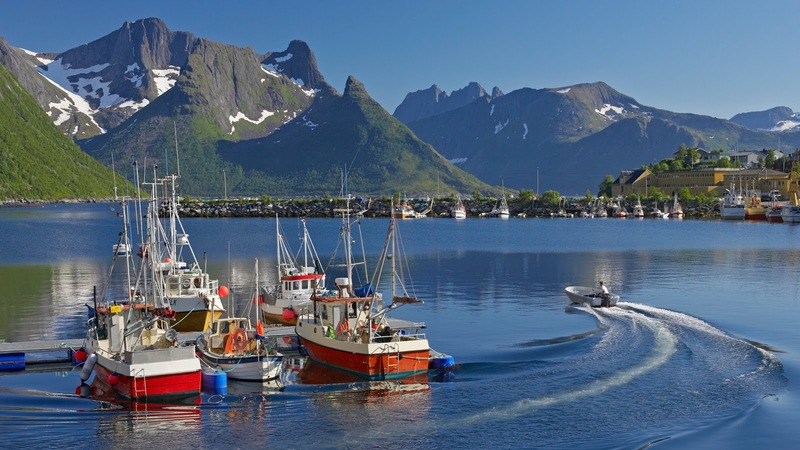 Some of the most spectacular Kodak moments await along the Senja National Tourist Route with plenty of stops along our way to Hamn for the evening and overnight in a 1880s fishing village, the Hamn in Senja. I have read there be tales to be told, tales of old on Senja: "Senjatrollet" is a story of a troll last seen on land as well as the sea; and the legend of "Mannen I Ausa," a mountain who finally got a face! Humpback whale watching in Vesteralen. Photo: Asgeir Helgestad Arctic Light and AS Visitnorway.com. Unauthorized use is prohibited. Safari's in the Arctic? Thar be whales on those safaris for sure upon our arrival at Andenes in Vesteralen. After lunch in the Andenes Whale Center and visit to the museum, we embark on our seafaring vessels in search of "them thar whales!" in the North Sea. After dinner, we'll slumber in rustic fishermen's cabins known as rorbuer. More heart-pounding adventures on the fjords await in Svolvær—RIB boating safari to Trollfjord in the Lofoten Islands, some of the most beautiful and photographed regions in Norway! My heart is pounding already! After a morning outing with Icelandic ponies, we'll embark on an Art Odyssey to the masterpieces of Skulpturlandskap Nordland sculpture project. This sprawling international 35-piece art collection spans 34 municipalities throughout Nordland and made possible through the collaboration of artists from 18 countries uniting in Northern Norway for an immersion into the culture and nature of their surroundings. Most of the pieces in the collection were created between 1992-1998 with two late additions in 2009 and 2010. 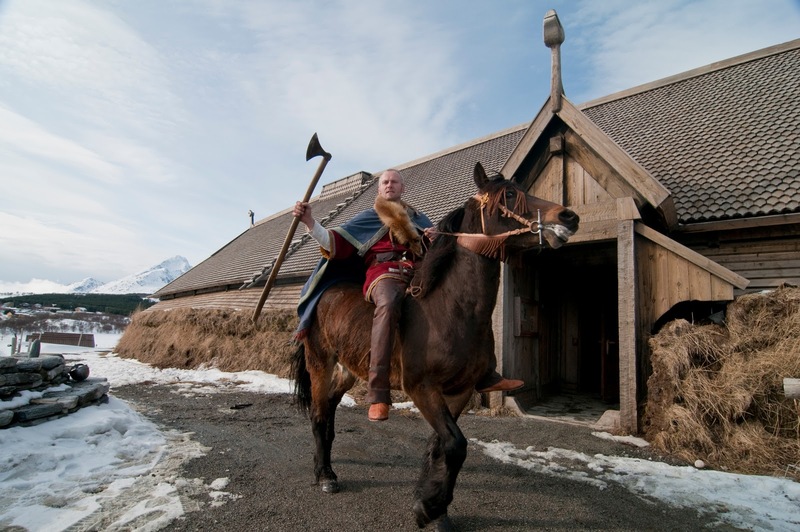 The Lofotr Viking Museum in the Lofoten Islands. 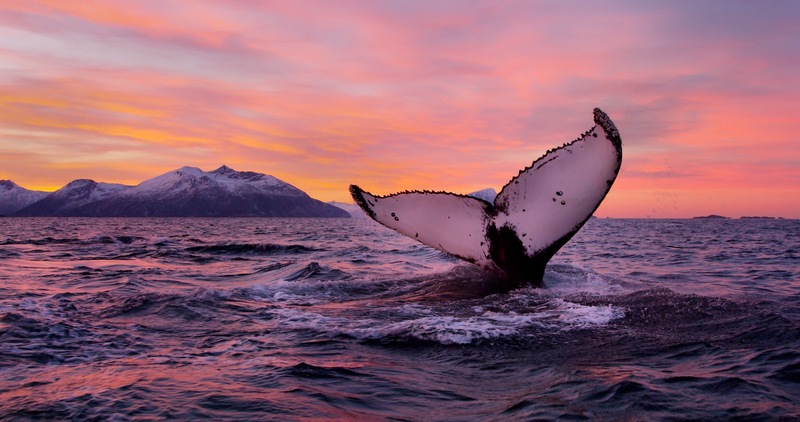 Photo: © VisitNorway.com. Unauthorized use is prohibited. Following art appreciation in the morning, it's off to the Viking Museum in Lofotr and then surfing lessons in Unstad. 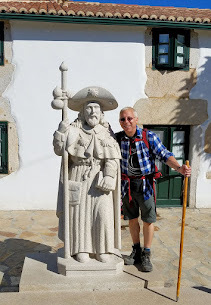 I think I'll opt for the local hike to explore the area and photograph my beautiful surroundings—getting down with nature again and again! 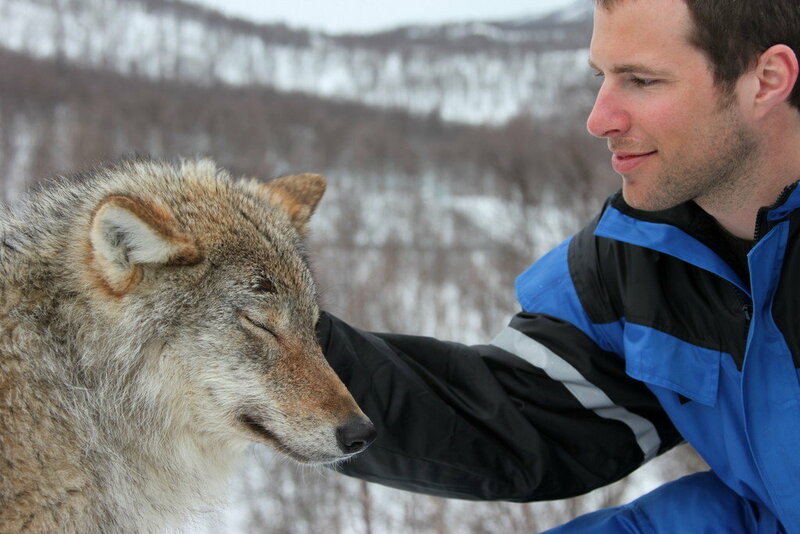 Kissing Wolves at Wolf Park.Photo: © NorthernNorway.com. Unauthorized use is prohibited. Our final kiss from Norway will come on the last full day and promises to be one of the most exhilarating experiences yet—Wolf Lodge where we'll kiss and howl with the wolves under the midnight sun. Built entirely within Polar Park's wolf reserves, our lodge is accessible only via an underground tunnel from the "other side," (perimeter fence). Up close and personal won't begin to describe the canine encounters with these fascinating denizens of the wild. For now, that's a wrap on expedition Northern Norway. I hope you follow along beginning June 5 when we land in Oslo. Eternally grateful to the folks at Visit Norway and Northern Norway for their extraordinary invitation to the Arctic wonders of Northern Norway. Of course, all opinions are my own, but I can't speak to the occasional howling. This sounds like an AMAZING itinerary, and I will absolutely be following along starting June 5!! We're heading to Norway next year though haven't figured out how we're traveling yet; will be a shame to miss the Northern Lights, but I think the midnight sun is equally as spectacular to experience :) Have a great trip! Hi there Megan and thank you so much for all of your support! Can't wait for the journey to begin. And yes, the midnight sun will be spectacular in and of itself!! Thanks for following along too!! Ahhh!!! I've spent some glorious time in Sweden but haven't gotten to Norway yet. These photos make me want to visit so much! We've only just begun my friend!! Lots more to come! Thanks so much for stopping by and sharing your thoughts!! The photos are spectacular, especially the one with the whale and the one with the wolf.this just makes want to visit Norway so much! Thank you for sharing. Hi there Luminita and thank you so much for your kind comments, but all photo credit on the "pre-journey" article goes to the talents of Northern Norway!